I’m often asked how to convert a recipe into a pressure cooker recipe. So the last time I converted a recipe to make in an Instant Pot, I wrote down the steps. Today I’m sharing my tips for converting a traditional recipe to make in electric pressure cookers. Before you convert a recipe, ask yourself: Is the recipe a good choice for the pressure cooker? The first step is picking a recipe that is well suited to the pressure cooker. The pressure cooker requires liquid to achieve pressure. So ideally the recipe will have some liquid in the recipe already. Slow cooker recipes, soups, meats, legume and grain recipes are generally easily adapted to the pressure cooker. If you want a crispy, fried coating on your meat or veggies, pressure cooking is not the best method. If you’re cooking meat that’s very lean, or expensive and tender already, the pressure cooker is probably not the best method for cooking that meat. 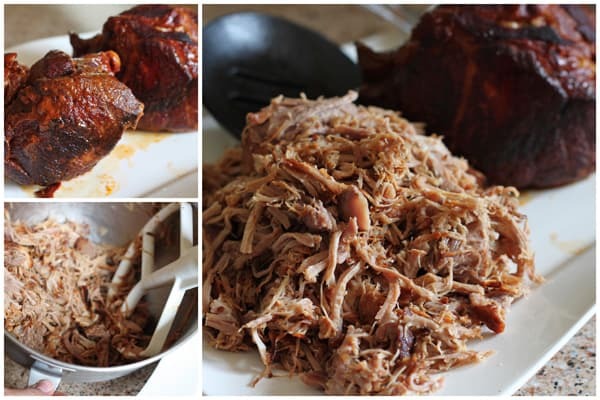 The pressure cooker excels at taking tough, fatty meats and turning them into tender, succulent meat. It excels at making soups quickly that taste like they’ve simmered all day long. It’s also perfect for cooking root vegetables. Two of my favorite vegetables to cook in the pressure cooker are potatoes for potato salad and spaghetti squash. It’s the only way I cook rice now, and it makes cooking dry beans a breeze. How do I know what cook time to use when I convert a recipe? The next step is determining cook time. Ideally, you can find a similar recipe online or in a cookbook and use the cook time used in that recipe. Then change the ingredients to use the ingredients from the recipe you’re adapting. If you can’t find a similar recipe, then use a reliable chart to find the cook time for the main ingredient in your recipe. 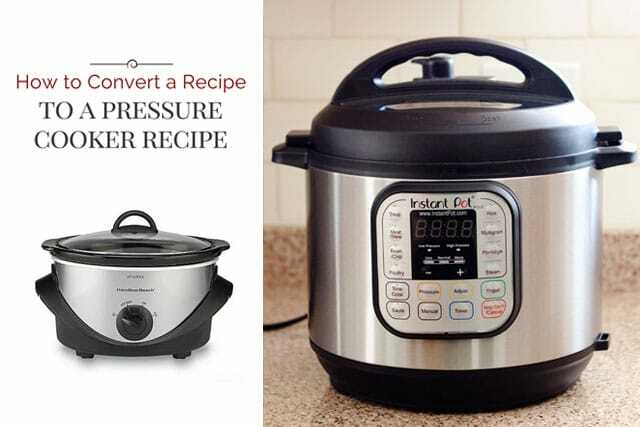 I often use the charts in Pressure Cooker Perfection from America’s Test Kitchen, Vegan Under Pressure by Jill Nussinow, and Hip Pressure Cooking by Laura Pazzaglia. Hip Pressure Cooking also has helpful cook time charts online. As a starting point when adapting a recipe, I reduce the cook time of meat recipes cooked in the oven or on the stove by two thirds. For pasta I reduce the cook time by one half. What if the ingredients have different cook times? If you’re cooking a dish with meat, the size and shape of the meat matters more than the volume of the meat. A big 3 lb. whole roast will take much longer to cook than 3 lbs. of the same roast cut into bite size pieces. Can you cut the meat so the cook time matches the cook time for other ingredients? For example, small bite size pieces of chicken breast have the same cook time as white rice. So cutting the chicken into bite size pieces lets you cook the chicken and rice at the same time. If they don’t have similar cook times consider cooking the longest ingredient first, then adding the vegetables, such as potatoes and carrots and cook for a few minutes longer. For example, if you think the meat will take 50 minutes to pressure cook and your vegetables 6 minutes, cook the meat for 50 minutes and release the pressure. Add the veggies, put the lid back on, bring the pot back to pressure and cook for an additional 6 minutes. You may be able to wrap quick cooking items in tin foil or put a pot on a trivet on top of the longer cooking item to slow down the cooking time. How much liquid should I use when I convert a recipe to a pressure cooker recipe? Generally 1 cup of liquid. If you’re using ingredients that contain lots of water, such as chicken, fruit or vegetables, you may be able to use less liquid. Since there’s very little liquid loss when you pressure cook, you generally have to reduce the liquid in recipes like soups and braises so you don’t water down the flavor. 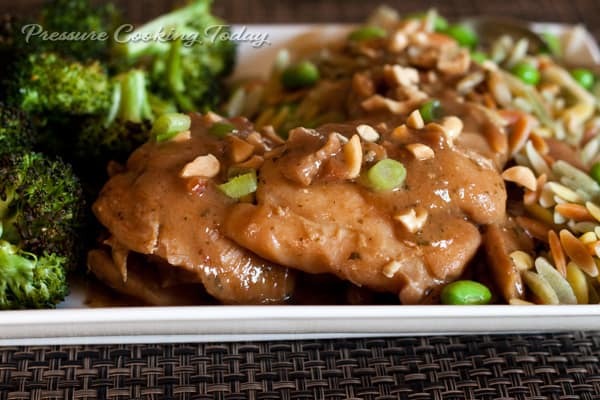 My Pressure Cooker Thai Chicken Thighs recipe is adapted from a slow cooker recipe from 365 Days of Slow Cooking. There’s slightly less than 1 cup of liquid in the recipe, but because chicken releases lots of liquid while it cooks, there was no need to change the amount of liquid. However, I was able to reduce the cook time from 6 hours to 9 minutes! What ingredients shouldn’t I use in the pressure cooker? If there are thickeners, such as corn starch or flour, in the original recipe, make a slurry and add them after pressure cooking. An example of how to make a corn starch slurry is my popular Beef and Broccoli recipe. Don’t flour your meat before browning it. It can create a layer on the bottom of the pressure cooking pot that will prevent it from coming to pressure. Generally, add dairy products and cheeses after pressure cooking. Should I do a natural or quick pressure release? Meat generally benefits from a natural release but if you’ve got pasta or vegetables in the pot and you’re worried about overcooking the ingredients, use a quick pressure release. For more information visit my Quick Pressure Release or Natural Pressure Cooker Release post. Keep a notebook of tips when you convert a recipe for the Instant Pot. Cooking in an Instant Pot or other electric pressure cooker is easy, but you’ll want to make notes when you convert recipes to make in one. Write down notes so you’ll know what changes you made and can tweak the recipe the next time you make it. Or, if you’re cooking from a cookbook, I’ve started writing notes in the margins so I can duplicate what changes I made. Once you’ve adapted a couple of recipes, it gets easier. You learn to trust your instincts and use your senses. If you’d like to print this post to keep in your notebook, I created a printable pdf version. Now, it’s your turn. I’d love to hear your tips and tricks. If you have a tip that helps you convert a recipe, please leave a comment. If I didn’t answer your question about converting a recipe, leave me a comment too and I’ll do my best to answer it. If you’re new to using the Instant Pot, be sure and check out my posts on Which Instant Pot Button to Use and Quick Pressure Release or Natural Pressure Cooker Release. I wonder if keto chicken could be made in an insta pot… 4 chicken breasts siting in 1/2 cup heavy whipping cream 4 tbs butter and seasoning baked at 275 F for about 3 hours. Hi Michael no, you need a thin liquid for the pressure cooker to come to pressure. You can pressure cook the chicken in chicken broth and then drain the broth and use the saute function to simmer it in the butter and cream. You can get fall apart chicken in about 20 minutes, although I would recommend boneless skinless chicken thighs because they are much more tender and juicy when pressure cooked. *I read in Ultimate IP Cookbook regarding converting recipes: To prevent ‘plastic liquid’ from tomato’s high viscosity and provide enough liquid to bring the instant pot up to pressure, to add a 2:1 ratio of water for Diced canned tomatoes. By my calculation: my hand crushed (4-28oz whole peeled) tomatoes:to (2 cans) which would be 7 cups of added water? •	Ready in about 20-40 minutes? Bad plan? Needs to be tweaked? Too much water? Enter a cooking time? Enter a pressure level? Normally made on the cooktop, in a 10qt stockpot, double the ingredients listed above, and WITHOUT Any Added Water; simmers about 2 hours on medium low too low, once the soup becomes steamy – but not boiling. Hi Sam – here’s my recipe for beef stew https://www.pressurecookingtoday.com/beef-stew-in-the-pressure-cooker/ which has similar ingredients. I use a 10 minute cook time. I think your tomato to water ratio sounds just right. I’ve got a chili recipe I’m trying to convert. It says to add 6 cups of beef broth and to let simmer for a minimum of 3 hours, (5 lbs beef for the meat) as well as adding half a beer while cooking. I’m wondering how to convert it (full recipe at https://imgur.com/gallery/f8Ex8) and I’m thinking reduce the water in the making of the broth to 1 half cup, use the half a beer, and add those together with the beef bullion. Would that work? And if so, how much time should I pressure cook it for? I am trying to convert this recipe… would it be possible? Hi Jackie – you would make it similarly to this recipe https://www.pressurecookingtoday.com/pressure-cooker-beef-and-broccoli/ although you’ll need to increase the water to 1/2 cup so you’ll have enough liquid to come to pressure (or you could just double the sauce ingredients so it’s more flavorful.) Always thicken after pressure cooking, so don’t add the cornstarch to the sauce until after cooking. Hi Cheryl – I would reduce the water to 1 cup and 1 cup ketchup and cook it similarly to this https://www.pressurecookingtoday.com/pressure-cooker-old-fashioned-chili-dog-sauce/ After pressure cooking you can add more ketchup and use the saute function to thicken the sauce to your desired consistency, stirring frequently. I have a pork loin that says to bake for 35-40 minutes in the oven. So would I sauté it then pressure cook it for 20 minutes? Trying to figure out just how long to pressure cook meats that are already prepared from the store. If I cut the pork Loin in half would I pressure cook it for a shorter time? Hi Betty – typically you’d use 1/3 of the cook time. So for a pork loin which is pretty lean, I’d try 11 minutes with at least a 10 minute natural pressure release. I’m trying to convert a casserole containing sausage, sliced potatoe, sliced carrot, rice, onion, peas and tomato soup and water. Original recipe states 1-1/2 to 2 hours @ 350F. I am trying to convert my favorite spaghetti sauce recipe to the pressure cooker. I am new to the pressure cooking and have only used it twice. So I am just not sure if its possible. I brown 1 lb of ground beef and add 1 large can of tomato sauce usually about 30oz and 2 cans of water 60oz and some seasoning. Then I simmer on low for 4 hours or so until it gets thick. Is that possible to convert to a pressure cooker recipe? Hi Candace – you can cook the sauce in the pressure cooker because you have a large amount of water to create the steam to bring it to pressure, but it won’t reduce and thicken while pressure cooking. You would have to use the saute function to thicken it. Although it may be easier to maintain a low simmer on the stove. I’m a young cook just got a crock pot multi pot for the holidays and have been trying to convert as many recepies as possible since my boyfriend of 10 years is starting his master’s program and I’m starting my cosmetology program soon. Once recipe I’ve been worried about is my great grandmas fra diavolo sauce. Normally I put whole peeled tomatoes with seasoning on stove stop bring to boil reduce to summer then throw it in the oven for an hour. It’s my boyfriend’s favorite recipe but with our busy lives right now I just don’t have time to make it for him. If I try making it in the pressure cooker how long would that take? Thank you so much in advance. Hi Tatiana – if the peeled tomatoes have enough liquid in the can, you could pressure cook them for 5 minutes instead of simmering on the stove, but to reduce it so the flavor concentrates as it does in the oven, you’d have to use the saute function and I’m not sure it would be significantly faster or better than the oven. I have a easy ground beef recipe I typically do on the stove top. It’s 1# ground meat (I use venison) brown it . Add 1/4 C flour and water to make gravy, add 1/4 cup sour cream mix well. 1Tbsp Beef Bouillon & dill. Make noodles to go in it. Can this easily be converted to instant pot? I have a Hawaiian ribs recipe passed down from my grandmother (I’m a senior now) and wondering if there is enough liquid in the sauce to make it in the main pot or should I use the pot in pot method. Ribs are sauteed and then the sauce is poured over and simmered on the stovetop for a couple hours. The sauce is 1 C ketchup, 1/2 C vinegar, 1/2 water, other ingredients brown sugar, dry mustard, black pepper, paprika, sliced onion, worcestershire sauce, tabasco & green peppers. Pineapple tidbits are added at the end. Or might there be another setting better suited for this recipe? Also depending on cooking method, can you advise the cooking time. I make a dish called calico bean bake. It has 5 types of canned beans, cut up pieces of ham and cheese. In the oven it cooks for an hour at 350. Would the instapot be about 20 minutes? I was trying to convert some casseroles in the oven to pot in pot in my IP. Would I still do the cook for 1/2 to 3/4 less time? The recipe I wanted to do had cooked pasta and cooked chicken topped with cream soup and baked at 350 for 30-35 mins. So would I put it in the pan (sitting on the trivet with one cup water in the IP) for about 10 minutes? Or would that turn my pasta to mush? Hi Sarah – I think 10 minutes sounds just right.